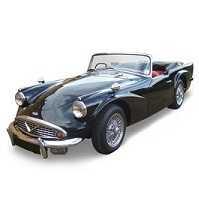 Custom tailor made car cover for the Daimler Dart models from 1959 to 1964. This cover comes in its own handy case and fully tailor made from high quality materials. When you have decided on the cover you need, simply change the boxes below to the correct type of car cover for your Dart. The indoor cover fits my dart really well. Feel as though it will be protected from light scuffs and won’t need washing before I take her out.